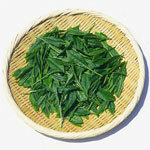 Ocha (Japanese Green Tea) contains large amounts of Catechin, a Polyphenol. Studies show that Catechin reduces the number of harmful intestinal bacteria, and its strong antioxidant effect works not only to reduce cholesterol but also to prevent high blood pressure, arteriosclerosis and cancer. The positive effects of Catechin in Japanese green tea are believed to contribute to the long average lifespan of the Japanese people.